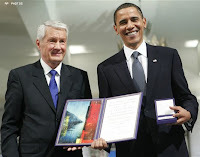 Oslo: US President Barack Obama evoked the cause of a just war on Thursday, accepting his Nobel Peace Prize just nine days after sending 30,000 more US troops to war in Afghanistan but promising to use the prestigious prize to "reach for the world that ought to be." Obama became the first sitting US president in 90 years and the third ever to win the prize--some say prematurely. He and his wife, Michelle, whirled through a day filled with Nobel pomp and ceremony in this Nordic capital. 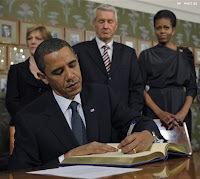 Obama delivered a Nobel acceptance speech that he saw as a treatise on war's use and prevention. He crafted much of the address himself and the scholarly remarks--at about 4,000 words--were nearly twice as long as his inaugural address. "I face the world as it is," Obama said, refusing to renounce war for his nation or under his leadership, saying that he is obliged to protect and defend the United States. "A nonviolent movement could not have halted Hitler's armies. 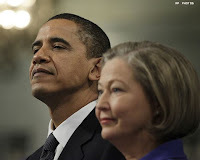 Negotiations cannot convince al-Qaida's leaders to lay down their arms," Obama said. "To say that force is sometimes necessary is not a call to cynicism, it is a recognition of history." Obama laid out the circumstances where war is justified--in self-defense, to come to the aid of an invaded nation, or on humanitarian grounds, such as when civilians are slaughtered by their own government or a civil war threatens to engulf an entire region. "The belief that peace is desirable is rarely enough to achieve it," he said. He also spoke bluntly of the cost of war, saying of the Afghanistan buildup he just ordered that "some will kill, some will be killed." "No matter how justified, war promises human tragedy," he said. Obama also emphasized alternatives to violence, stressing the importance of both diplomatic efforts and tough sanctions to confront nations such as Iran or North Korea, which defy international demands to halt their nuclear programs, or those such as Sudan, Congo or Burma that brutalize their citizens.